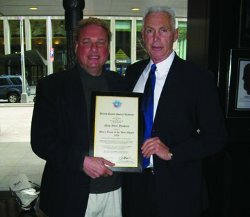 Yankees President Randy Levine, left, accepts the 2009 Male Team of the Year Award from Harvey Schiller, a former Yankees CEO and 1996 Distinguished Service Award recipient. New York Yankees President Randy Levine accepted the 2009 Men’s Team of the Year award from the United States Sports Academy. Making the presentation was Dr. Harvey Schiller, a former chief executive officer of the Yankees, and the winner of a 1996 Distinguished Service Award from the Academy. The Yankees returned to the top of the baseball world in 2009 with their first World Series championship in eight seasons. New York’s power-laden lineup beat the defending champion Philadelphia Phillies in six games for the title. The return to the top was especially sweet for the Yankees, who in 2008 missed the playoffs for the first time in 13 seasons. They were buoyed by the free-agent additions of pitchers C.C. Sabathia and A.J. Burnett as well as slugging first baseman Mark Teixeira. The newcomers added to a collection of talent that included homegrown stars Derek Jeter, Mariano Rivera, Jorge Posada and Andy Pettitte, as well as star third baseman Alex Rodriguez, who shook off his past postseason struggles and shined in the playoffs. The Yankees won their championship in their first year in a new stadium, across the street from the venerable, historic Yankee Stadium in the Bronx. Jeter, the Yankees’ captain and star shortstop, broke Lou Gehrig’s all-time franchise hit mark during the season, and later on became the first Yankee to be named Sports Illustrated’s Sportsman of the Year.